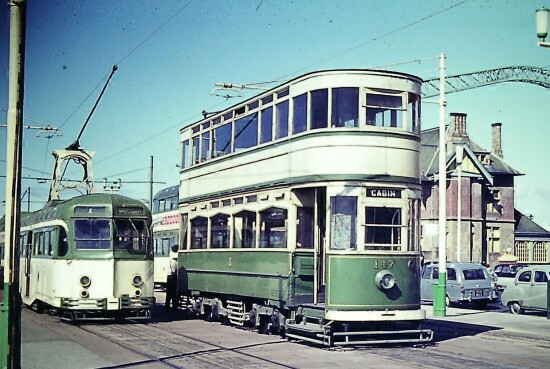 Today we have two “Pictures in Time” as we take a look at Blackpool’s Standard 147 in 1962 and 2009 – of course for a large period of time between these two years the tram was in the USA but both these images come from its time in Blackpool. The first photograph shows Standard car 147 in 1962 in all day service at Cabin where it has just had the trolley turned ready for the return journey to Pleasure Beach. This tram built in 1924, was the first Standard car to have the destination display above the drivers window. This was done to improve visibility for prospective passengers during the wartime blackout. Until then all Standard cars had the destination display above the upper deck front window. It was withdrawn from service in 1966 and made the journey across the Atlantic Ocean in 1967 to the Trolleyville museum in Ohio but never operated there. It returned to Blackpool in 2000 and after a major restoration returned to service in 2002. It has subsequently been named ‘Michael Airey’ in honour of the person who spearheaded the project to bring the tram back to the UK. 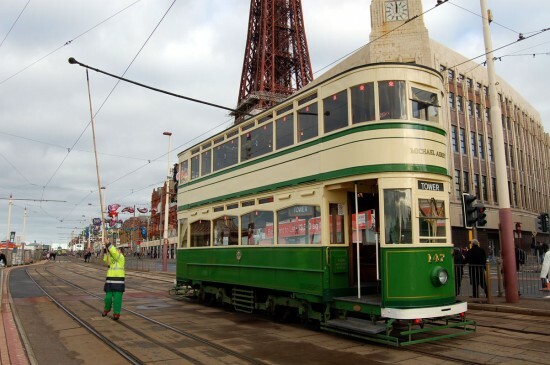 The tram is now part of the heritage fleet in Blackpool. Alongside 147 is an unidentified English Electric car on service number 1 from North Station to Cleveleys. This was the only numbered tram route in Blackpool . The Dickson Road track, the last inland section of tramroute, would be abandoned the following year in October 1963. The second photograph shows 147 in service in November 2009 on a charity shuttle service between Pleasure Beach and Tower, all the fares being donated to charity. The driver was dressed as Santa Claus! Almost identical except for the stop lights in the 2009 pic – and (long before Metrolink started the fashion that all British tramways do now) running without headlights on in daytime in 1963. The irritating stickers on every top deck window and almost every lower deck window reminding passengers that smoking is not allowed – is just slightly over the top. I dont recall the need for Blackpool’s buses having similar nanny state ‘thou shalt not’ warnings plastered over every available window. The plethora of warning and caution notices now plastered inside the light rail fleet is similarly disturbing – once upon a time Blackpool trams had two small notices advising that children over a certain age were required to pay full fare (or was it below a certain age travelled free): and the opening and closing of doors could only be done by the Conductor. Also on Balloon Cars – neat notices on the stairway panelling advised that luggage was carried at the Passenger’s risk. Now those were the days.